The Sarasota County area offers a wide array of attractions including world-class beaches, museums, theater, dining, shopping, sports, music, nightlife, events, and festivals. For more information, visit http://www.visitsarasota.org. Click here for a list of local things to do before and during the 2017 Bowls USA US Open tournament. Pre-ordered Catered Lunch Plan Available Now! To pre-order catered lunches during tournament, click here or send e-mail directly to Wendy Brayman at BRMN6@aol.com. For more information, call 1-603-345-1817. Note: Due to the overwhelming amount of players, tournament play will go quite fast and you will not have time to leave grounds for food. Sunnyside Caféwill serve hot lunches in the Sarasota Municipal Building (click here to see photos from 2016 tournament lunches) and Sun City Hospitality will serve lunch in their club house. On Wednesday afternoons, the Sarasota Lawn Bowling Club turns into a teen scene. Suncoast Video hosts get lawn bowling lessons from Sarasota Lawn Bowling Club President, Daniel Jittu. The show airs each day at 4pm and the following morning at 9am. Men's Singles. Scott Roberts defeated Ron Rollick in the play off. Women's Singles. Margi Rambo defeated Rosa Baer in the play off. Men's Pairs. Steve Smith/Bill Brault defeated Rob Schneider/Rob Behncke in the play off. SRQ Magazine: At 90 Years Old, Can Sarasota Still Breed Olympic Athletes? 90 years ago, the Scots who settled in Sarasota couldn’t have known that the then tiny bayside city might be providing a path for US Olympic Lawn Bowling hopefuls to Budapest, Paris or Los Angeles in 2024. World Bowls, the worldwide governing body of the Lawn Bowling community has petitioned the International Olympic Committee to participate in future games endorsed by the Commonwealth Games Federation. Interestingly enough, a section of the bid was borrowed from Daniel Jittu, President of the Sarasota Lawn Bowling Club's presentation to host the 2016 and 2017 US Open games in Sarasota. According to Neil Dalrymple, CEO of Bowls Australia, the world of bowls started taking notice of the United States when the US women's Lawn Bowling team took home the gold in March at the China Open in Shenzhen. Dalrymple applauded Sarasota for taking a lead role in this success. Unlike other countries, where greens are as frequent as Starbucks, only a few public parks are still open to bowlers thanks to visionaries such as Marcellus Jocelyn, Del Webb and Roy and Walt Disney, all avid bowlers. For more information visit: www.bowlsusopen.com. 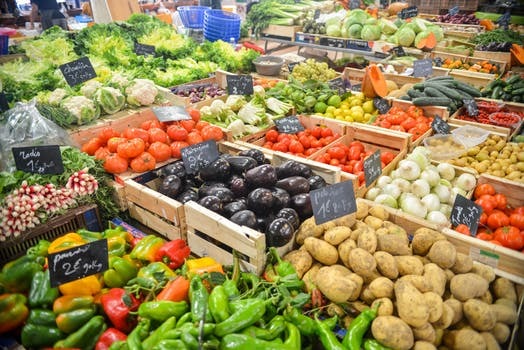 On Saturday, there will be a Food Truck Rally and Antique Car Show in front of the Auditorium, and the US Open Lawn Bowling finals and closing ceremonies next door, including a party afterwards inside the Auditorium. Bagpipers from the Riverview High School Kiltie Marching Band and Sarasota Military Academy plus the SMA Color Guard will perform at the opening ceremonies on Saturday, November 12, 2016 from 2-5:00pm. The pipers are a tribute to the importance of the Scottish community in the development of lawn bowling as a local and world sport. A bagpiper from local Scottish organizations plays Amazing Grace each Sunday at sunset in Bayfront Park near the Dolphin fountain. This community activity is independent of the US Open tournament. The Piper in the Park program pays tribute to the landing of the Scots in Sarasota and their founding of the city in 1885. Recently, the Sahib Temple Pipes & Drums Band were guest pipers. 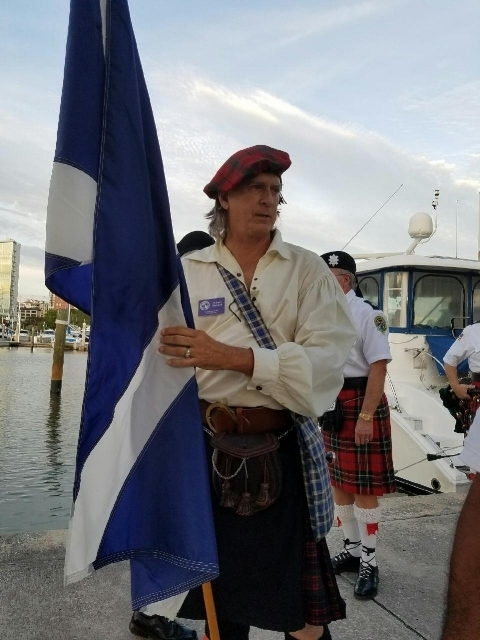 Robert Howard, President of the Caledonian Club of Florida West, holds the flag of Scotland at one of the Piper in the Park events. The Caledonian Club of Florida West is a sponsor of both the Piper in the Park program and Bowls USA 2016 US Open. Dan Jittu of the Sarasota Lawn Bowling Club, Piper Rob Thierfelder of the Caledonian Club, & the staff of the Chidley Library pose for an after-party photo for the Historical Bowls Exhibit & Cocktail Party. In less than 30 days, athletes from 14 countries will participate in the Bowls USA 2016 US Open for Lawn Bowling, a sport invented for noble knights to practice their skill and knowledge of warfare and diplomacy. Sarasota Lawn Bowling Club, the first and oldest tenant of the city-owned Bayfront property, will host this event on November 12–19, 2016. The tournament is open free of charge to the public. 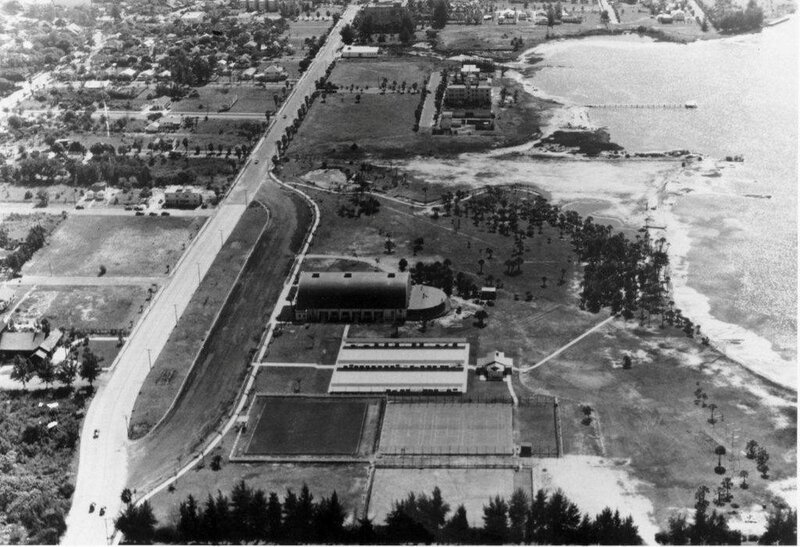 The Lawn Bowling facility is comprised of three historic greens positioned between the Van Wezel sign on 10th street and the Art Deco Sarasota Exhibition hall at 809 North Tamiami Trl. Next April, your view of the club will dramatically change with the installment of the roundabout. Vehicles will pass within three feet of the greens giving drivers a clear view of the sport. The Sarasota Lawn Bowling Club is raising monies to provide night bowling for the community. This November, the Sarasota Bayfront will be festooned with the colored shirts of athletes from around the world as Sarasota hosts the Bowls USA 2016 and 2017 US Open Lawn Bowling Championships. The Sarasota Lawn Bowling Club is the oldest tenant on the Bayfront established in 1927. The event is a collaboration between the City of Sarasota, Visit Sarasota, both City and County Parks and Recreation Departments. Other groups like Sister Cities, Historical Society, Caledonian Club and the Garden Club have all added their support to welcome participating athletes from 14 countries. Lawn bowling has been a tradition in Sarasota for 90 years and recently was hailed as one of the areas fastest growing sports. According to Daniel Jittu, Chairman of the US Open, the games will showcase the sport to Sarasotans while showcasing Sarasota to the world. US Open tickets and the Health and Lifestyle Expo coinciding with the event will be free to the public. For more information visit: www.bowlsusopen.com. Whilst the world is enthralled by the athletes and their achievements at the Olympic Games in Rio, World Bowls continues in its endeavour for IOC recognition for Bowls. This week, John Bell, World Bowls President was interviewed whilst at the English National Championships by TalkSport recognition and gave an update and some background on the submission process. The North Central Florida League (NCFL) also known as the Traveling League celebrated its 82th birthday this year. Organized in 1934, the NCFL was the first true competitive league and the longest lived of any lawn bowling league in the U.S.
At the World Bowls European Development Seminar being staged in Glasgow this weekend Gary Smith, World Bowls Chief Executive announced that World Bowls has launched the formal process of seeking International Olympic Committee (IOC) recognition for our sport. ‘We had to await the results of a full review undertaken by the IOC of their eligibility criteria to firstly ensure that we met the minimum number of member nations criteria. The review was completed in December 2015 and the criteria were issued to us a couple of months ago and we meet this criteria. The initial step required was to send a formal letter to IOC advising them that we are seeking their recognition. This positive development will be welcomed by our global bowls community and we will keep you fully informed of progress with our application. We must stress that inclusion of Lawn Bowls on the Olympic Games Sports Programme does not come immediately with IOC recognition of our sport, recognition is only the first step and the foundation from which to lobby for inclusion on the Olympic Games Sports Programme but recognition will in itself bring great benefits to our members.